Geek, Nerd or Dweeb? : Euro 2004 :: Ricardo being the Hero for Deservant Portugal!!! Euro 2004 :: Ricardo being the Hero for Deservant Portugal!!! Before the game :: I went out late of the office. Finished off my previous blog and went out. Get back home and, bathe up and get dressed. Went out to PJ then KL to pay for my Credit Cards. Then went to Sunway and was looking around doing nothing. 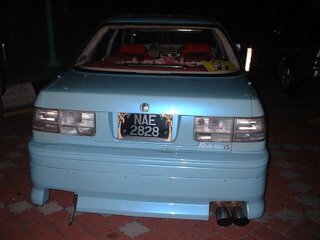 Then I was seeing these cars.. For this weird and so eye-aching car, I thought i can only see it in the Internet, but now it's in Sunway!! 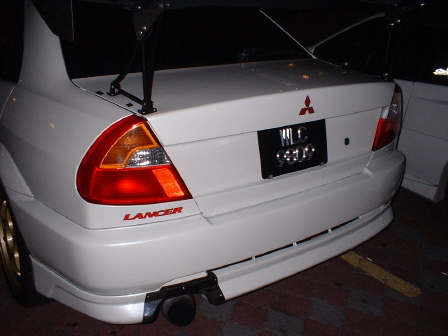 This Evo5 is having a huge GT Wing. Look stupid tho. 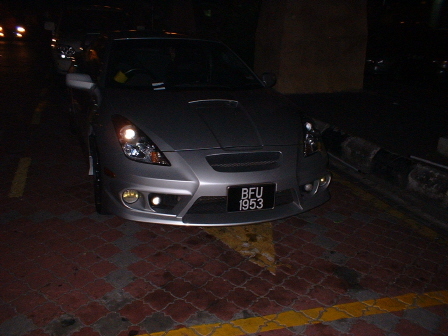 This nicely done Celica blowed fire through it's muffler tips when it rammed. Had Supper :: Done with that.. Went to Khalifah in Subang. Still had time to left out a Lancer Turbo on my way there.. Sizuka (Suzuki) Swift is just not that bad huh? Had 2 half-cooked eggs, 2 roasted bread, iced milo and iced plain water.. then here we go. Ball Talk :: Ajai & Nurul was the artist celebrities. Ajai was doing quite good for stopping 33% of the goal shootouts. Boring, but I was still so ok, so energetic to watch this so important game of Euro2004, at least for me.. Then the game starts.. Early Goal :: Euro2004 will always be Euro2004. Normally, the team that scores as early as 5 minutes in a game will again, NORMALLY lose the game. That's how I feel when England scored their first goal through a mistake done by the Portugal defender, the advantage was then taken by Michael Owen and he finished it in a style that quite impossible for people like me to imagine. Then, the time goes so fast, that makes me feel a bit okay and safe. Waiting for the first half to end up was like waiting for a punishment. So tense and nerve-gasping. But for me, the Portugal really conquered the game. They work really hard but England. This really bad, and much worse that I felt that England won't make it. 2nd Half :: England was too defending themselves, until Figo was taken out of the field, but that someone who replaced him then scored a goal at the minute of 83 to extend the game to extra time with Silver Goal rule. Silver Goal :: Extra time have 2 halvesof 15 minutes each. If the first half, a team scored a goal then, they still continue up to the 15 minute time. If the opponent didn't score any goal then the 2nd half is eliminated. The team that scored the goal is considered the winner. They implemented Silver Goal as the Golden Goal is now considered unfair. Extra Time :: The first half no goal. England played so badly. Portugal works really hard to achieve winning. You can see each and every pass, shots, cross by the Portugal are just too good. The english was like lazy, exhausted, and badly they just like don't even care. I think they wanna delay the game to penalty. Extra Time (2nd half) :: Damn. Portugal scored a goal as early as 4th minute and celebrated it. 5 minutes later, Lampard scored a leverage goal for England. The position 2-2 stays till the end of the extra time. Penalty :: Started with England. First kick by Beckham. DAMN!!!!!!!!!!!!!!!!!!!!!!!!!!!!!!!!!!! He kicked the ball too high! He's kewl, but how was that happened? Everyone else get the ball in to the net accept for Rui Costa who kicked the ball off goal. Till 5 kicks, the position in 4 all. Then 6th kick, both went in, till the seventh kick, Vassel taken the kick but IT WAS SAVED by RICARDO. and the worse thing is, it was like RICARDO gonna be the Hero for his country. He took the last kick and he gets it in! Argh.. Here we go.. England is out of the competition now. And it's, and Portugal is now should never be having problem on it's route to the Finale. About the stars :: They deserved it. They really deserved to win. But as we all can see in this whole Euro2004 campaign, most stars, especially from Real Madrid (you who they are) were just there to be the captain, or just there to be the spiritual statue. You can see it clearly. For me they are, Figo, Beckham, Raul... except for Zidane, they were all contribute less that what they are suppose to do as a star. Zidane is a star and he played as a star. Portugal :: As a home team, they really deserved it. They proved it that as a home team, they work really hard to prove that home team will always have the advantage over other teams. They play it hard. They work hard. The strive and force themselves to get a goal, to achieve victory. The game was totally controlled by them. People would be expecting a total anger when Scolari took out Figo out of the game, as he used all three substitution opportunities to change the game. It works! The game has totally change. Postiga who replaced Figo scored a leverage goal so that the game can be extended to extra time with silver goal rule. Getting in Rui Costa has really change the game pattern and he scored the leading goal 2-1 in the minute of 109th. England :: Not much comment. Boring game. Just a goal and started to be defensive. Especially, when Rooney was injured (I think he was intentionally done by the Portugal hahaha), taken out and substituted with VASSEL? I never know him before and he replaced Rooney? The game would be much different if Rooney was not injured. We can see then, Gerard was also taken out. I don't know what was their plan, maybe to be defensive, even Shebby noticed, after Gerard and Rooney was taken out, middle field that was controlled by England was totally lost to the Portuguese. Beckham played badly. He wasn't playing as he supposed to play as a star. No good moves. No good kicks. No special crosses as he always did when he was in Manchester United. He was just like me when I'm on the field. Lost and do nothing. I'm a bad soccer player too. But I didn't play for my nation so who cares. Winner :: They deserve to win. That's all.. I was driving back home with a very sad feeling. Was like to go straight to work but later I found out myself wake up at around 10 o'clock.. So we'll wait for tonite's game. France & Greece, I'll pick France of course. Review.. I'm not so used to any one of them except for Zidane and Henry..
A Weekend of Euro 2004!!! Thorsdaeg :: A loser day..
Today :: A New Discovery..